Bazinga: Foundation Course Papers to be rechecked! Home Weekly Wits Bazinga Bazinga: Foundation Course Papers to be rechecked! Almost a month after the declaration of FYUP results, the University of Delhi has decided to revaluate the FC papers. This decision has come amidst numerous protests against the inflation of scores and the shocking disparity in marks from college to college. Under the new system, a foundation course is for 75 marks, out of which 55 are marked through projects, presentations, class discussions etc and the remaining 20 are allocated to a centrally prepared exam. This test was also evaluated within each college, making the entire process of assessment of Foundation Courses an internal one. Some students have scored from mid 80s to 90s, a feat which seemed impossible for an average college student till just last year, making it clear that DU was now going the CBSE route and inflating scores. The University also cited the obvious inequality in the marks distribution in different colleges as one of the reasons behind this decision. It’s not just the students who were appalled by the discrepancies, even teachers are empathizing with their students, “Since history is a theoretical paper, I gave my students a maximum of 45 in their projects and presentations and 15 out of 20 in their exam, I was shocked to see that other colleges had given their students as many as 53 in the internals and a full 20 in the exam!” said a teacher from CVS. As per the notice issued in this regard, the FC answer sheets will now be rechecked like those of the Discipline Courses to ensure an impartial marking. The new results will be out by the end of the month. 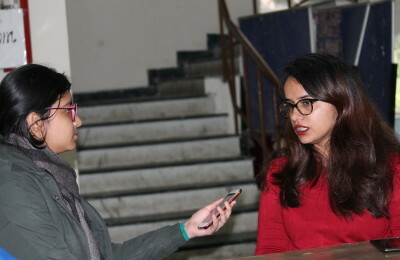 The University can be seen buckling under the pressure from DUTA, DUSU, and other organizations protesting against the FYUP and demanding a rollback.